Entitled One of the Few Moments, Gyula Várnai presents five new works at the church space of the Kiscelli Museum. 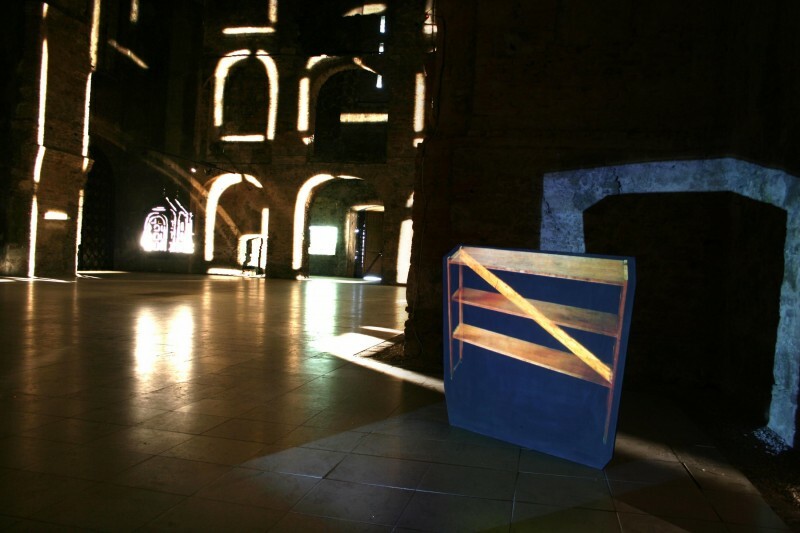 The light-, video- and sound installations forming a coherent presentation both visually and conceptually, reflect on the past and the function of the former Trinitarian church-space. Varnai's appproach is neither historical or reconstructional, but rather is to show the alternatives of personal relationships to sacredness. This installation, taking place in the apse of the church space, explores the possibilities of modeling our subjective relationship to time. This relationship differes by cultures but also by persons. 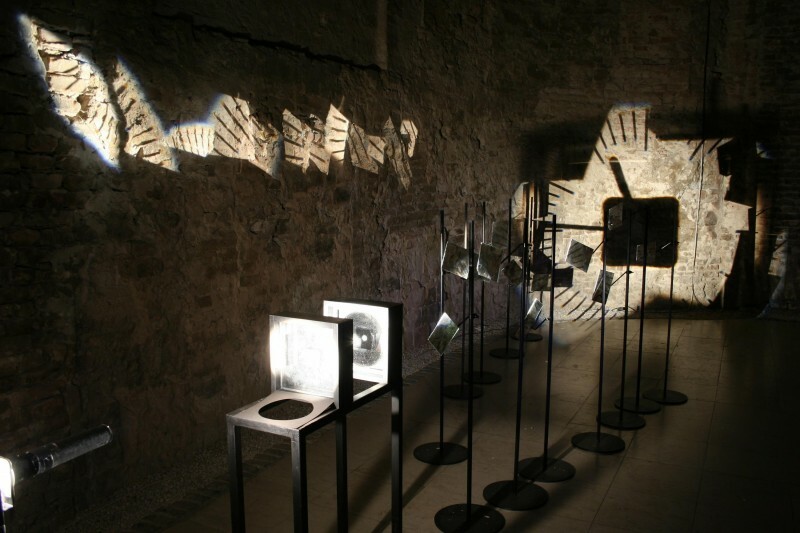 Várnai projects a large scale clock dial on the wall by breaking the ray of light with mirrors placed in various angles. The phases and image-fragments selected arbitrarily Várnai presents a visually and conceptually rich image-system. The church mock-up hanged from the ceiling works as a projection equipment. 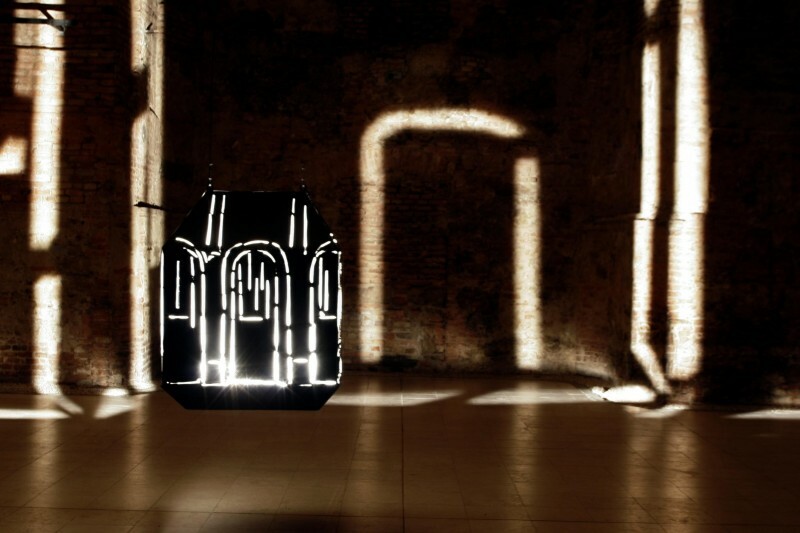 The rays coming through the vents draws a fictious, stylized enterieur of a church. This picture, however, is not a fixed sight, but it moves together with the mock-up hovering as a swing. Its movement resembles to the hover of a ship floating on the water, resulting a breathtaking experience. Várnai refers both to the word nave and its Latin meaning of the ship, and to the uncertain relationship full of doubts with sacrality as such. Through the vaulted gate replicating the proportions of the vaults of temples, noises of the profane world infiltrate to the space. The loudspeakers installed on the gate besides their ordinary function also have an ornamental role. The motif of the gate primarily faces us with the problematics of openness, but at the same time it works as a filter: refers to the dichotomy of the sacred and the profane world and to the questons of transition between religion and everyday reality. Window is presented at the exhibition as the metaphor of the personal point of view. In this work, through the picture cut out by the window and through the gently hovering movement and transparency of the curtain evoking bourgeois milieu, our attention is directed to the contemplative gaze and subjective attention. This artpiece seemingly sticking out from the rest is the one, which, through the modest carpenter work refers to the puritan furnishing of early-medieval churches. In the projection, rapidly changing each other, elements of a bookshelf appear. The object itself is never shown in a whole, its image is assembled by our brain from its flashing details.